Feb. 5: "This day comes on warm and pleasant, it being the finest day we have had since leaving port." The side of the sail against which the wind is blowing. The vessel might be described as being on a port tack or a starboard tack. and soon disappeared." On a square rigged vessel, a small square sail above the royal. for the first time." Illness characterized by chills and fever, sometimes associated with malaria. Today all hands have been employed in working about-decks. I have also this day made up my mind to leave off using Tobacco." Feb. 16: "I saw a few flying fish, they being the first I have seen." 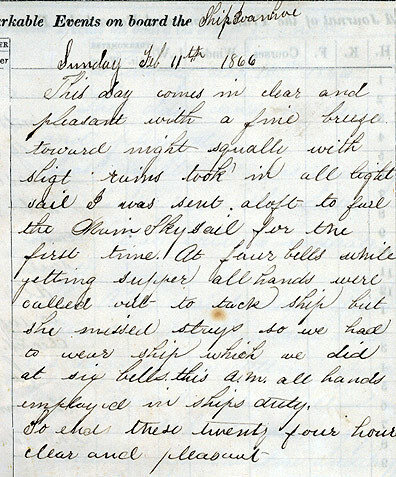 Feb. 17: "Saw a school of Black fish and Porpoise but not having our irons rigged they did not afford us any fun." Feb. 18: "I took a good fresh water wash and then turned in. This P.M. got my bedding on deck and aired it." Also Bos'n's Locker. A small compartment for tools and materials for repairing or making up rigging or cargo gear."